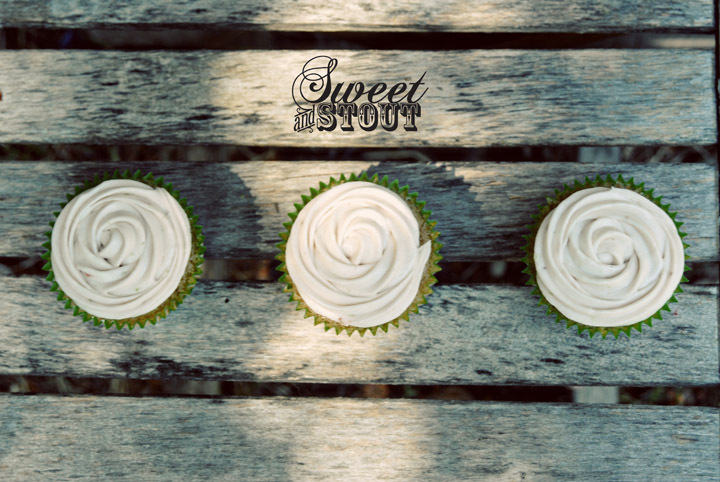 Sweet and Stout | Where beer and cupcakes unite! It is with a heavy heart when I tell you guys that Dylan and I are taking a break from the cupcake business. Tonight is our last night in the kitchen for a little while, and I can’t be sure when we’ll be back. I want to thank everyone who has been a fan and supporter, we wouldn’t have come so far had it not been for you. Right now Dylan and I feel it’s best to take a breather. I will continue to leave this blog up, there are some tasty recipes, and plenty of beer cupcake inspirations that I know people like to look at. Even with my lack of recent posts, this blog still has a pretty good daily average of visits, which makes me smile. We hope that everyone enjoys the holiday season with their families and loved ones. When we decide to come back, you will be the first to know. I know I’m long overdue for posting a new cupcake, and I’m sorry to say that I don’t have a new one yet. There’s been a lot going on in our personal lives lately, and it’s taken up a lot of our time. First some good news, I (Jackie), recently accepted a new job. I’m still a graphic designer, but now I’m working at Lawton Publishing. I’m really enjoying it, and it’s been keeping me very busy. Of course we called the police, but there wasn’t anything they could do because a crime had not been committed. We’re finding out that it’s really hard to catch someone for burglary unless you catch them in the act. So now we’ve been spending all our time being paranoid, and afraid to leave the house. We did get security cameras, which we can watch from our phones while we’re at work. There is some comfort in that. But now that I know he was planning on coming back and breaking in through a window, I’ve lost 90% of my confidence. I’m sharing this with you all because we don’t want to be victims anymore, and we don’t want to live in fear. We want to get our story out there, and we hope that this guy will get caught, very soon. There have been at least 8 break-ins, similar to ours, in a 3 block radius of where we live in the last couple weeks. It’s just getting ridiculous. This post is late! My apologies. This past weekend was filled with playing catch up, cleaning house, baking cupcakes, meeting friends, and general busyness! After being away from work, computers, and baking for 2 weeks, it’s been a bit tough readjusting, to say the least. Dylan and I both figured that by having the wedding stress over and done with, things would begin to relax a little bit for us … well, it hasn’t yet, but we’re still hoping! I’m sorry to report that we don’t have a new cupcake flavor to tempt you with this week. On Sunday we ended up getting an order for the Manito Tap House for 3 dozen cupcakes and that pretty much took over our afternoon. We just didn’t have it in us after that. Which leads me to something else I need to bring up here. While we are still planning on keeping this blog going, it’s going to have to change a bit for business reasons, and for my own personal sanity. It’s really a challenge to come up with a different cupcake flavor every week! I’m sure there are still ideas to be had, we’re just going to limit our cupcake experiments to once a month instead of weekly. There are a few other reasons to go along with this, including that it gets expensive to buy special ingredients every week to indulge our creative culinary adventures. We also want to spend more time growing our business. It’d be different if Dylan and I both didn’t work full time jobs, but that’s not going to change any time soon. Our goal right now is to get our cupcakes at a few new places around Spokane. Aside from all this business talk, Dylan and I got married! (As if you didn’t know already, I think I’ve talked about it a LOT on here, haha) It’s official, we are Mr. & Mrs. Sweet and Stout! Here’s a preview picture from our photographer, Shelia Carson Photography. Check her out, she’s awesome! Hi there! Pete and Andrea of Savor Sweets here. Since Jackie and Dylan are off getting themselves married (yay! 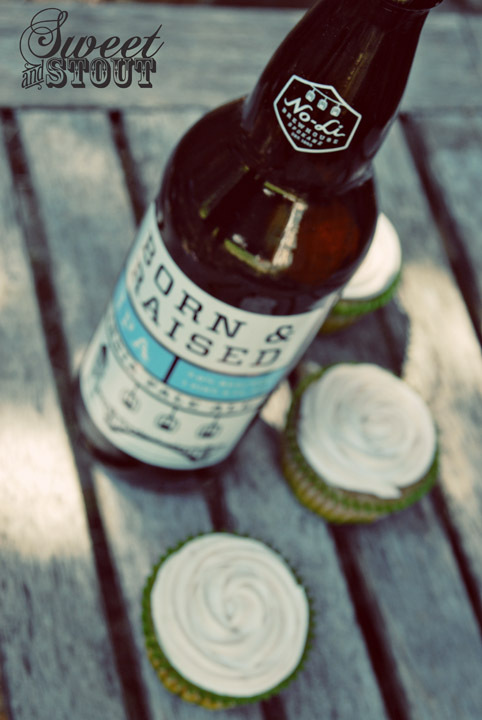 ), we asked if we could step in for the weekend and give this beer cupcake thing a try. Generally our expertise lays in candy, so this was a fun venture outside our comfort zone, and quite the learning experience! During the summer, I have been known to sit down with a half of a watermelon and a spoon, only to emerge thirty minutes later, feeling slightly guilty and very, very happy. 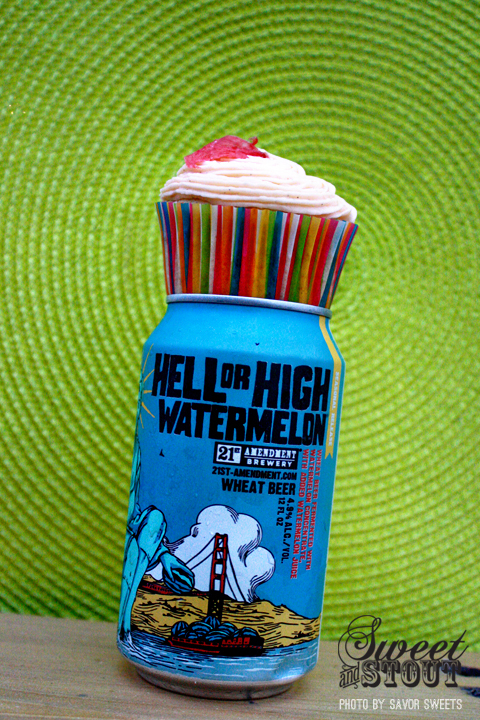 Those memories of watermelon came to mind when I heard of 21st Amendment Brewery’s Hell or High Watermelon beer. The beer itself is a light, wheaty beer with an aftertaste of watermelon. Not hugely complex, but great for a backyard BBQ or hanging out on the front porch after work. I figured this light, slightly fruity flavor would make for a great cupcake. 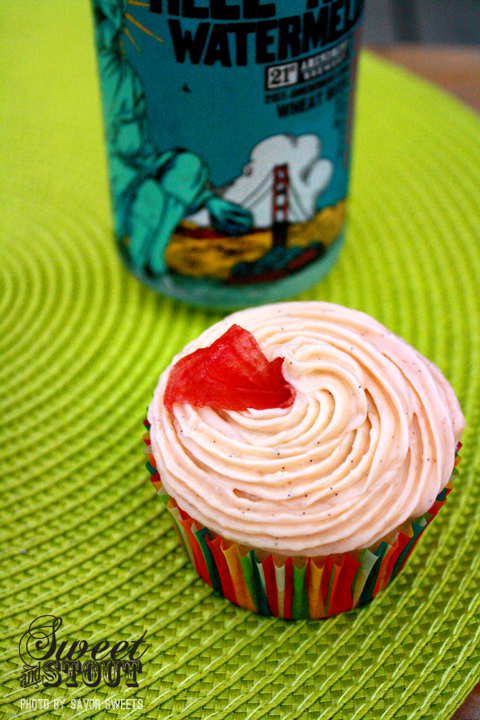 We have been experimenting with watermelon candy for the last few months, and that should have taught me that watermelon is one of those flavors that I should know better than to try and bake into a cupcake. The delicate nature of watermelon can even be assumed when you read 21st Amendment Brewery’s description: brewed with watermelon extract and enhanced with watermelon. We really wanted to do this without artificial extract, and wow it was a challenge. The good news is, the final cupcake we ended up with was pretty tasty, and definitely has a fruity flavor. It only took us three tries and twelve pounds of watermelon! In the end, in order to get the fruity flavor across without being completely overwhelmed with overly sweet one-note flavors, we took a three-pronged approach. First, we paired the watermelon with fresh-scraped vanilla beans. The pairing helped round out the flavor of the watermelon, which turns very one-note when baked. Finally, we reduced the amount of sugar in the cupcake itself, helping to balance the sweetness of the frosting with the cupcake. 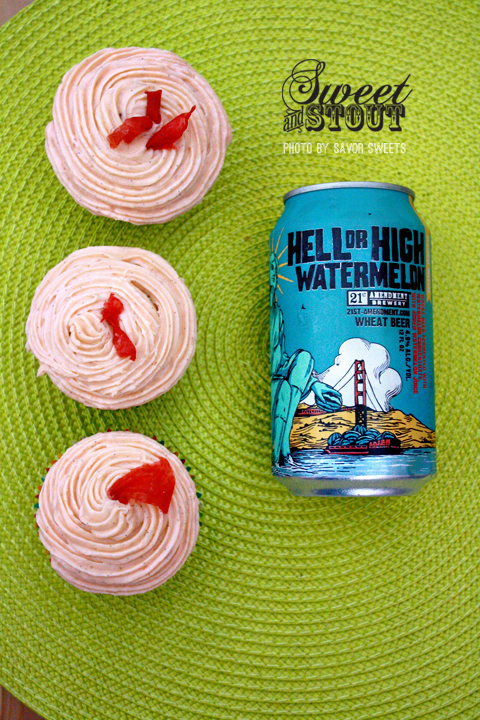 In the end, Hell or High Watermelon makes a very tasty cupcake, though these are enough work we’ll probably crack the beer much more often than we treat ourselves to the cupcakes. Happy Wedding Dylan and Jackie! 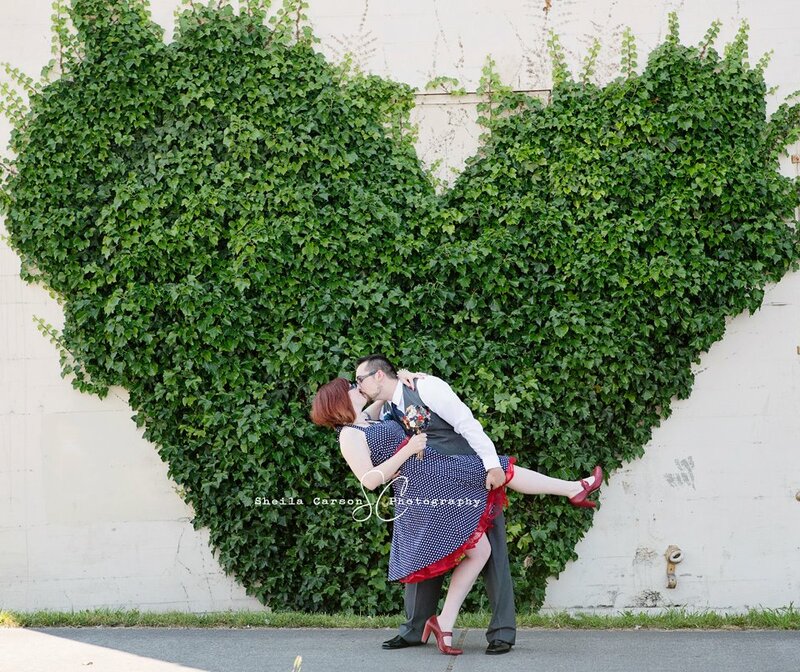 Dylan and I got married on the 21st in beautiful Bellingham, Washington! As much as we love you all here, we are out enjoying our honeymoon, so we’ve lined up a couple guest bloggers to take over in the mean time. We’ll be back in a couple weeks! We did a guest post over on cookingwithsurly.com a couple months ago and now Alissa is stopping by Sweet and Stout to do the same. She writes a great blog about cooking with beer in all kinds of recipes, you should definitely go check it out. We started chatting back in May about exchanging recipes, and both agreed it was a great idea. 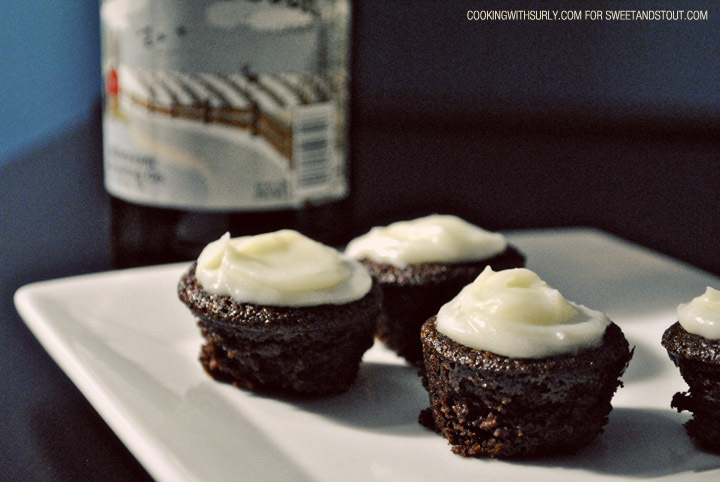 Alissa had been wanting to try her hand at beer cupcakes for a while, her recipe comes from Smitten Kitchen and is called “Chocolate and Whiskey Beer Cupcakes”. The title alone makes my mouth water! Alissa says the only issue with these cupcakes was that she bought a new silicone pan and figured that the paper liners weren’t necessary if you just grease it really well. As it turned out, the cake kind of stuck to the pan, so paper liners would have been more favorable. Even still, she was able to save a few for her photo of these delicious treats. Alissa used Schokolade Bock, from Millstream Brewing, and says it turned out good. Some styles of bock beer are dark and very malty, a great beer to pair with a rich chocolate cake. I think a dopplebock would be a excellent choice. Many thanks to Alissa and Smitten Kitchen for this amazing sounding recipe! Filling: Chop the chocolate and transfer it to a heatproof bowl. Heat the cream until simmering and pour it over the chocolate. Let it sit for one minute and then stir until smooth. (If this has not sufficiently melted the chocolate, you can return it to a double-boiler to gently melt what remains. 20 seconds in the microwave, watching carefully, will also work.) Add the butter and whiskey (if you’re using it) and stir until combined. Frosting: Whip the butter in the bowl of an electric mixer, or with a hand mixer, for several minutes. You want to get it very light and fluffy. Slowly add the powdered sugar, a few tablespoons at a time. In case we haven’t mentioned it enough, Dylan and I are getting married … this weekend! Finally after over a year of planning, our wedding is here. To say that we’ve been busy is probably an understatement. This week, I thought it’d be a good idea to visit a past post, and 1-up it by sharing the recipe. I’d say that’s a win for everyone! Remember those Crème Brûlée cupcake that we made back in September? Well, if you don’t, you can check it out here. 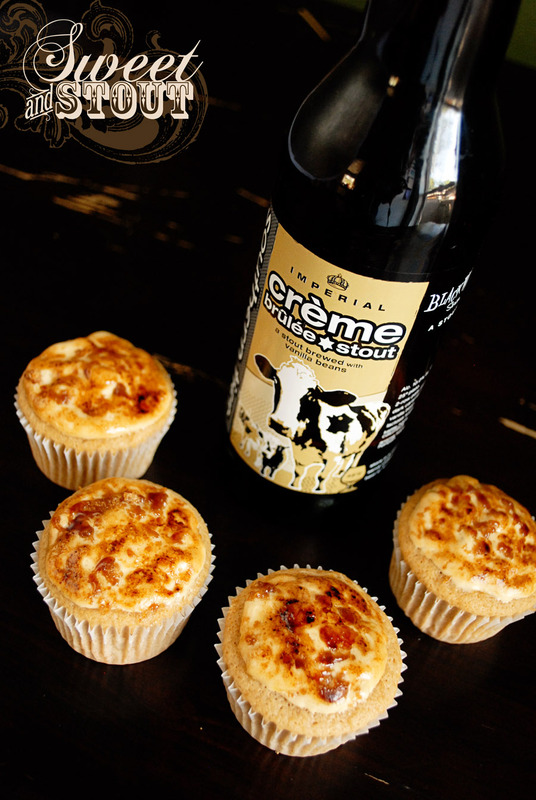 For these cupcakes, I highly recommend using the Crème Brûlée Stout from Southern Tier Brewing Company. If you can’t find it, another sweet stout could work too. Anyways, on to the important stuff! The recipe! This should make around 2 dozen cupcakes. 1. Preheat oven to 350 degrees, prepare cupcake pans with paper liners. 2. In medium bowl, combine flour, powder and salt, stir with whisk until mixed. Set aside. 3. In large bowl, cream butter and sugar until well combined. Add egg yolks and mix well. 4. Combine beer and heavy cream in measuring cup (it will look gross, just go with it) and add it to the creamed butter and sugar, alternating with the dry ingredients. Make sure to end with the dry ingredients. After that’s all together, add in the caramel and vanilla. 5. In separate bowl, beat egg whites (saved from earlier) until you get stiff peaks. Carefully fold into the cupcake batter using a rubber spatula. 6. 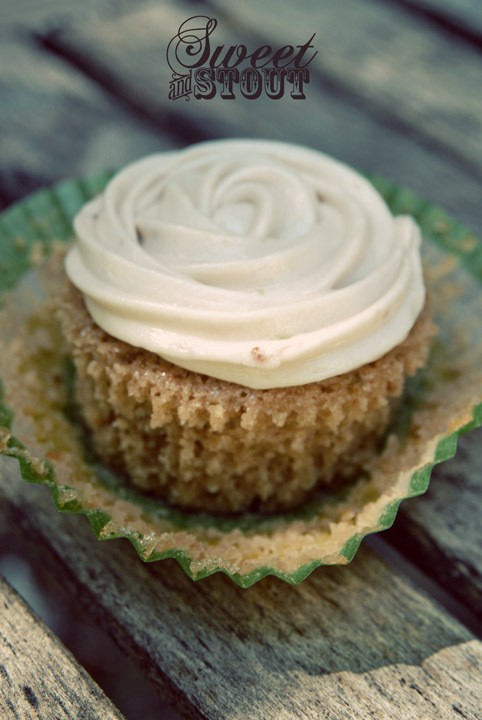 Fill cupcake liners 2/3 full and bake 18 – 20 minutes, or until a toothpick inserted in the center comes out clean. 7. In a double boiler, combine sugar, salt, and egg whites. Constantly whisk while sugar dissolves and the mixture gets warm. Then remove from heat and use an electric mixer to beat it until the egg whites form stiff peaks. Continue mixing until it cools, probably 6 – 7 minutes, all together. 8. Add in 2 tablespoons of the softened butter at a time while continuing to mix on medium speed. After all the butter is added, increase mixing speed and beat until it appears thick, 2 – 3 minutes. 10. Fill the cupcakes with the prepared filling. Sprinkle each with a little brown sugar, then use a Crème Brûlée torch to caramelize the top. We have this awesome torch-like lighter that worked perfectly for this. 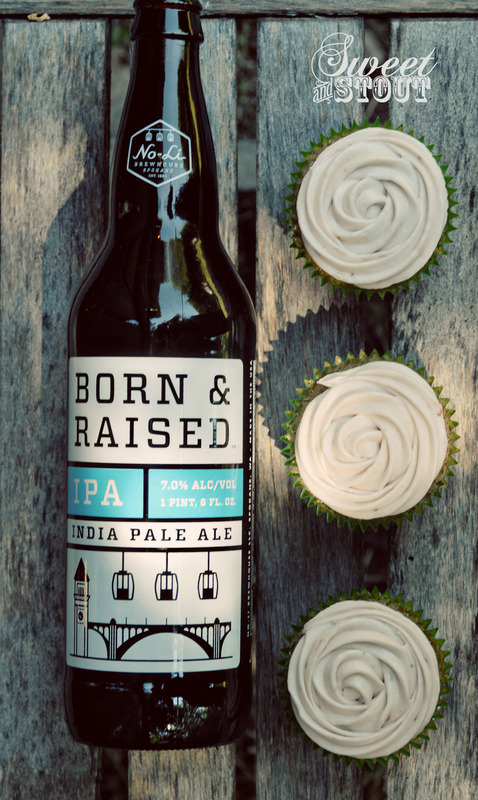 Enjoy these cupcakes with your left over beer, and you’ve got yourself an awesome dessert! Next week we’re going to have a guest post from Cooking With Surly, which also includes a recipe, so make sure you come back to check it out.